Traditionally, every week we bring you a list of the top performances of Cubans who are currently playing abroad. #1. This week's number one is an international swingman Karel Guzman (188-95, currently plays in Argentina). He led Olimpico de La Banda to a 3-point victory against the fourth-ranked Libertad Sunchales (3-5) 87-84 in the Argentinian La Liga in Tuesday night's game. Guzman scored 15 points, made 3 passes and 4 steals in 34 minutes on the court. Ciclista Olimpico de La Banda (3-5) is placed fifth in Group B. It's Guzman's first season with the team. He has relatively good stats this year: 11.8ppg, 3.0rpg, 1.7apg, 1.5spg, 2FGP: 60.6%(40-66), 3FGP: 29.0% and FT: 60.5% in 11 games he played so far. Guzman is currently a member of the Cuban senior national team. #2. Second place goes to an international power forward Jasiel Rivero (204-93, agency: Pro Sports, currently plays in Argentina). He could not help Boca Juniors (3-5) in their last game. Despite Rivero's very good performance the fourth-placed Boca Juniors (3-5) lost 77-87 on the road to the lower-ranked (#5) Hispano Americano de Rio Gallegos in the Group C. He was the second best scorer with 22 points. Rivero also added 6 rebounds in 30 minutes. This year Rivero has relatively solid stats: 14.0ppg, 3.6rpg, 1.2apg, 2FGP: 55.2%(48-87), 3FGP: 23.3% and FT: 62.2% in 10 games. 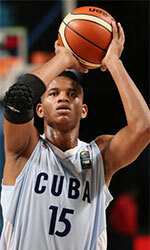 He is in the roster of the Cuban senior national team. #3. The Cuban player who performed third best last week abroad was an international forward Yoanki Mensia (197-97, currently plays in Argentina). Mensia was not able to help Gimnasia in their game against Ferrocarril (4-4) in the Argentinian La Liga. He recorded 5 points. Gimnasia (#2) was defeated 75-65 in Buenos Aires by the lower-ranked Ferrocarril (#3) in the Group D. This season Mensia averages: 3.2ppg, 2.6rpg, 2FGP: 39.3% and FT: 43.8%. He is also a member of the Cuban senior national team. #4. An experienced swingman Yorman Polas Bartolo (191-85, currently plays in Germany) was not able to secure a victory for Telekom Baskets (3-3) in their game against Deutsche Bank Skyliners (2-3) in the German BBL. Bartolo scored 7 points in 26 minutes. Telekom Baskets lost 79-83 in Frankfurt to the lower-ranked (#11) Deutsche Bank Skyliners. It was Telekom Baskets' third consecutive loss in a row. But the season just started, so everything may happen. This year Bartolo's overall stats are: 7.8ppg, 4.5rpg, 2.8apg and 1.7spg in six games. He has a dual citizenship: Cuban and German. Bartolo used to play for the Cuban national team back in 2011. #5. International center Javier Justiz (205-92, also represented by Pro Sports, currently plays in Spain) contributed to a 2-point Zaragoza's victory against the closely-ranked CB Canarias (4-3) 88-86 in the Spanish Liga Endesa on Saturday night. He recorded 8 points and blocked 2 blocks. Tecnyconta Zaragoza (3-4) is placed ninth in the Liga Endesa. They ended the series of three consecutive loses. But the season is still in it's first stage and everything can happen. Justiz's total stats this season are: 6.1ppg and 3.3rpg. He plays currently for the Cuban national team. #6. Power forward Grismay Paumier (205-88, currently plays in France) couldn't help Saint Chamond (3-1) in their game against Entente Orleans 45 (4-0) in the French ProB (second division). Paumier recorded 7 points and grabbed 8 rebounds. It was his first game for Saint Chamond this season. Saint Chamond was badly defeated 86-69 in Orleans by the leading Entente 45. It was Saint Chamond's first loss after three consecutive victories. Paumier is a former international player as he played for the Cuban senior team nine years ago. #7. Former international forward Georvys Elias (199-81, currently plays in Spain) managed to help HLA Alicante to win against the second-ranked Villarrobledo (5-1) 76-67 in the Spanish LEB Silver (third division) in Saturday night's game. He scored only 2 points. HLA Alicante (4-2) is placed fourth in East group. Elias' total stats this season are: 3.5ppg and 3.0rpg. He used to play for the Cuban national team nine years ago. #1. Howard Sant-Roos (200-F-91, currently plays in Basketball Champions League) contributed to AEK's victory against the eighth-ranked JDA Dijon (1-4) 90-80 in the Basketball Champions League last Tuesday. He recorded 10 points, 3 assists and 3 steals. AEK Athens (3-1) is placed second in group C. It was his team's third consecutive victory in a row. But this is still an early stage of the season and everything may happen. This year Sant-Roos averages: 8.5ppg, 1.5rpg, 3.0apg and 3.0spg. #2. Sigfredo Casero-Ortiz (185-PG-97, currently plays in Belgium). Casero-Ortiz could not help Okapi Aalstar (2-4) to beat Oostende (5-1). He scored 7 points and added 4 passes in 28 minutes. Okapi Aalstar lost 77-86 on the road to the leading Oostende. But there are still lots of games to play and it's a long way to go. This year Casero-Ortiz's total stats are: 6.3ppg, 1.8apg and 1.8spg in six games he played so far. He has a dual citizenship: Cuban and Belgian. Despite Casero-Ortiz's Cuban passport, he currently plays for the Belgian U20 national team and is not eligible to play for the Cuban team. #3. Juaquin Duarte (192-G-88, currently plays in Mexico) was not able to help Santos in their game against Fuerza Regia (6-2) in the Mexican LNBP (second division). He cannot count Tuesday's game as one of the best ones. Duarte scored only 3 points in 2 minutes on the court. Santos (#6) lost 82-89 at home to the higher-ranked (#3) Fuerza Regia in the North group. It was Santos' fourth consecutive loss in a row. This year Duarte averages just 0.6ppg in five games. #4. Yankiel Moreno (189-G-90, agency: Interperformances, currently plays in Italy) contributed to a Baltur Cento's victory against the 15th-ranked Cagliari DA (1-5) 87-76 in the Italian Serie A2 (second division) last Sunday. Moreno scored 7 points and added 5 passes in 23 minutes. Baltur Cento (4-2) is placed third in East group. This year Moreno's total stats are: 6.8ppg, 4.5rpg, 4.0apg and 1.7spg in six games. He is another player who holds two passports: Cuban and Italian. Despite Moreno's Cuban nationality, he previously played for the Italian U18 national team and probably cannot be called to the Cuban team. #5. Marlon Diaz (200-F-98, currently plays in Argentina) was not able to secure a victory for La Union (4-4) in their game against Rocamora (4-1) in the Argentinian La Liga Argentina (second division). Diaz cannot count Friday's game as one of the best ones. He scored only 2 points. La Union (#3) was defeated 76-70 on their home court in Colon by the second-ranked Rocamora in the South - C.South group. Diaz's total stats this season are: 1.0ppg and 2.3rpg.